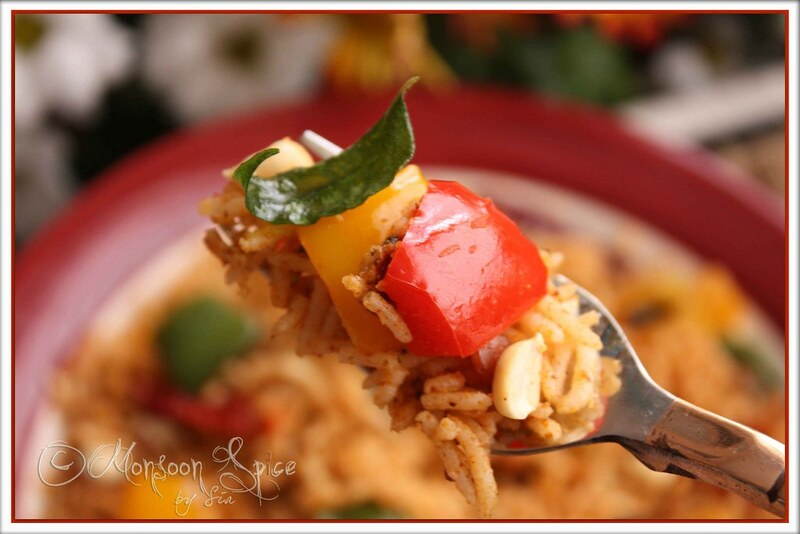 Monsoon Spice | Unveil the Magic of Spices...: Capsicum Masala Rice: An Ode to Vibrant Spring! At last my favourite weather is here to stay. Yes, I am talking about spring, the season of new beginning! It’s the season of bursting colours and heady fragrances. The streets in our neighbourhood are lined with cherry blossom trees and other flowering trees. So every morning and evening when I take a walk to work and back home, I feel blessed to walk under these trees where they shed their delicate petals while swaying to cool breeze. I find it really difficult to step on those delicate pink and white petals and crush them under my feet. So if you see some girl wearing crimson red jacket, walking cautiously with bowed head and taking small and big jumps in between walking, then you don’t have to think twice as who that person is! You knew I was little bit crazy, didn’t you? Well, sunny daffodils and vibrant tulips competing with the magnificent rainbow ob blue sky will surly make anyone go crazy and wonder at the splendour of Mother Nature blessing on us! 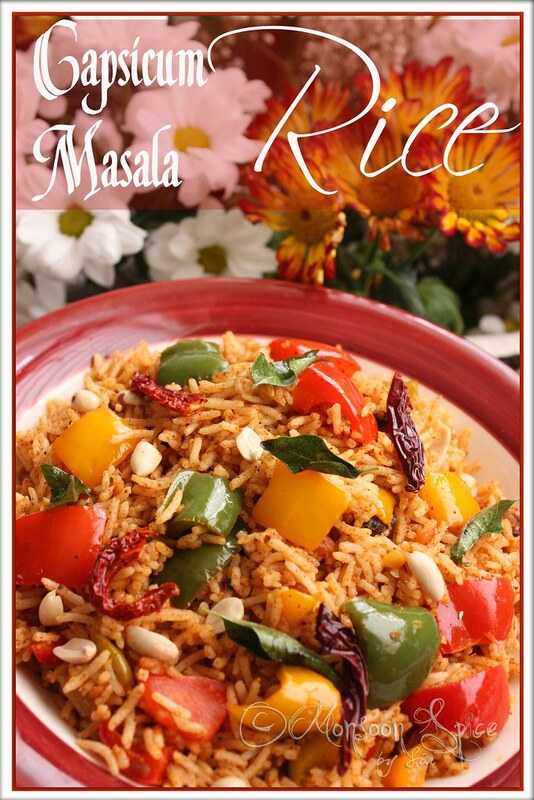 To match the dazzling colours of spring, I made this colourful Capsicum Masala Rice from dear Sailu’s blog. This fast and flavorful dish is a simple recipe, quick and easy-to-make and so tasty! 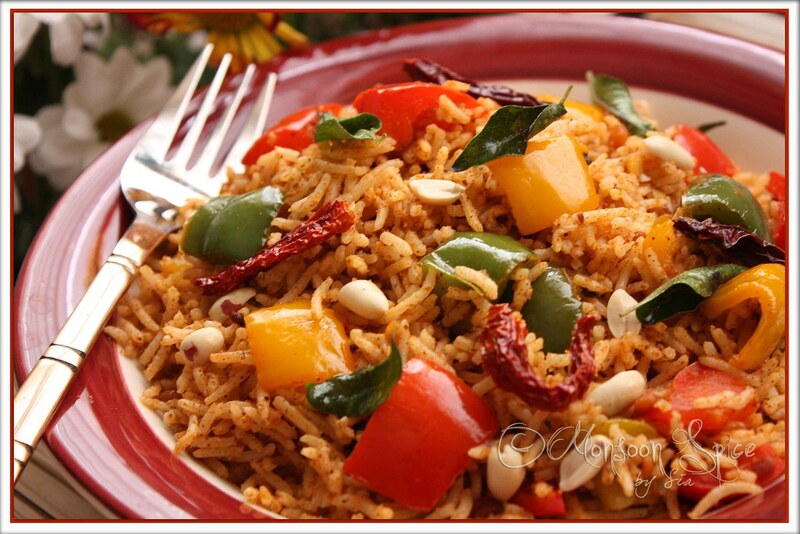 Fresh crunchy capsicums, masala flavor and crunchy peanuts jazz up the taste of the rice dish and make this recipe a real winner! And I completely agree with her. The peanut powder along with roasted and freshly ground spices lends it oh-so-good nutty flavour and the coloured peppers give it nice crunch along with vibrant colour. The aromatic tempering of curry leaves along with other ingredients and roasted peanuts gives it a nice crunch and wonderful flavour. I tweaked the recipe a bit to suit our taste. Over all, this recipe of Capsicum Masala Rice is a keeper and very simple and quick one without compromising taste and flavour! Thank you, dear Sailu for sharing this colourful and delicious recipe. Doesn’t it look like I have served you wonderful colours of vibrant spring in that bowl? Its my ode to vibrant Spring! Before I forget, Wishing all the readers of Monsoon Spice a very Happy Vishu! 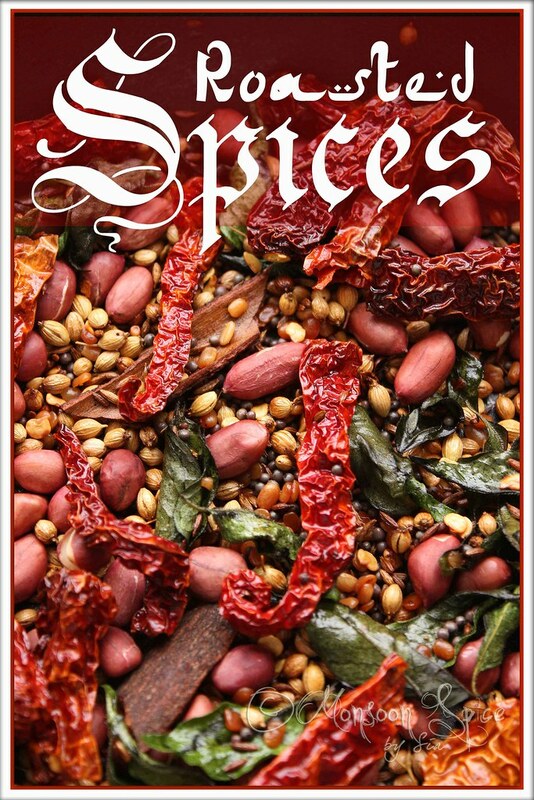 Heat ½ tbsp of oil in a pan and all the ingredients (except roasted peanuts) listed for spice powder and roast them on low flame for 2-3 minutes till the lentils turn light golden and heady aroma of roasted spices fills your kitchen. Let them cool completely before you grind them to fine powder. Set aside this spice powder till needed. Heat 1 tbsp of oil in a pan and add mustard seeds, channa dal, urad dal, hing and curry leaves. Sauté till mustard starts to pop and splutter and also the lentils turn golden brown. Add chopped capsicums and stir fry for 1-2 minutes till its skin starts to wilt. Mix in ground spice powder, jaggery powder and salt to taste and simmer for 2-3 minutes. Now add cooked rice, lemon juice and peanuts and gently mix them well till every grain of rice is coated with spice mixture. Cook for another 1-2 minutes till every grain of rice is heated through. Serve this delicious bowl of Masala Capsicum Rice with chilled Yogurt/Raita, pickle and papad and enjoy. Hmmm....looks like a wholesome meal! Looks so colourful and summery! Happy Vishu Sia :) that colorful rice sure looks like spring! The pic of the spices is just out of this world. Looking so colourful..Love capsicum rice. the rice and the pics are sure spring-y! :) the roasted spices look great! That is a beautiful rice dish! what a perfect dish for spring! Looks so colorful and mouth-watering Sia! What an absolutely breathtaking array of colours!! I love the flavours you have blended into the rice - am going to try it soon! Happy vishu to you too. The rice looks very flavourful. Stunning pictures!! I love mixed rice. Wow Sia,I just made this on weekend with slightly different spices with green capsicum. This looks so colorful. Bookmarked..Will make it today. Its so nice to see the wonderful spray of coloured one experiences when we see your pictures , it really looks cheerful. Lovely rice n lovely pics...the photo of the roasted spices i outstanding!! I am recent foloower of ur blog , & i am very impressed by your blog u have some wonderful recipes & the photos make more tempting.I have already bookmarked some of ur recipes & have already tried two , they turned out to be very nice. Capsicum rice looks so delicious ,vibrating with colours and flavours ..
Looks like you have captured spring in a bowl of rice. Love the colorful rice and te aromatic spices that go into it.